Though the word ‘Federation’ doesn’t find a mention in our constitution and it declares India as a Union, albeit India is a Federation with strong center. The circumstances at the time of independence mandated it be so. The times have changed and a policy shift is needed, a radical one. Going by the steps and his actions Modi is taking India successive co-operative federalism. He has been an advocate of the same since the days when he was chief minister of Gujarat. By accepting recommendation of 14th Finance Commission report he has signaled a clear policy shift to co-operative federalism and competitive federalism too. Modi has stated that his government is determined to take India in the era of ‘Cooperative federalism’ and ‘Competitive federalism’ replacing the earlier systems of centralized federalism in which the state governments were reduced to the states of subordinates to the central government’s overwhelming authority over all the 29 states and 7 union territories of India. He started his journey towards this radical but needed shift with dismantling the Planning Commission and announcing a new body called NITI Aayog, elaborately covered in the previous articles. Now by accepting the recommendations of the 14th Finance Commission headed by Y.V. Reddy, former RBI governor, he has indicated an action plan to implement the same. This articles doesn’t delve more into the details and recommendations but tries to give reasons why this was needed. Federation: The best example of a federation is USA which is result of agreement between states and where sates have more autonomy in terms of legal and administrative personality. Co-Operative Federalism: National and state governments tackle issues together in a cooperative fashion as compared to the unitary system or a system which strong centralizing tendencies. This concept also traces its roots to USA. The center assumes role of a facilitator and states and center work as a team. attempts to solve problem of lack of toilets would be more needed in other parts of India than Sikkim, Goa, and Kerala. Under this model the center becomes enabler and states get more freedom and autonomy to make plans according to their needs taking into account their location, demography etc. In words of Narendra Modi “Can we develop a new mechanism, that plans according to India's strengths, empowers states, and brings on board all economic activity, including that which happens outside the government,"
It is worth noting that even in 2012 the parliamentary committees had recommended a serious re-look at Centralized Planning model, Modi has gone ahead with a great emphasis on that. Modi Government accepted the recommendations of 14th Finance commission on February 14th, 2015. Distribution of net proceeds of taxes between Centre and the States, to be divided as per their respective contributions to the taxes. Determine factors governing Grants-in Aid to the states and the magnitude/amount of the same. To make recommendations to president as to the measures needed to augment the Consolidated Fund of a State to supplement the resources of the panchayats and municipalities in the state on the basis of the recommendations made by the Finance Commission of the state. What’s most noteworthy about it? Modi himself stated that the “states are free to change” centrally sponsored schemes and they should “decide for themselves”. Though the increase which is 10 % is lowered when adjusted against the budget dilutions as there would substantial reductions in the centrally sponsored schemes. But still there is a significant increase in the state’s resources and enhances their resources and also their responsibility and would be expected to display financial prudence and discipline. It is not that the Planning model would be abandoned, on that things would be clearer when details of NITI AAYOG would be out. Though there were voices of dissent, like eminent economist and a member of the 14th Finance commission Abhijit Sen. Some ‘enlightened’ voices are saying this Fiscal federalism is only pretense to facilitate the emergence of capitalist market system for the whole country. But as Victor Hugo said, nothing is as powerful as an idea whose time has come. Including the increased share of devolution from the ‘divisible pool’, now more than 70 percent fund will flow through the Finance Commission .This is indeed a very welcome move that will strengthen the states and give them liberty to choose according to their needs, also making them more responsible. 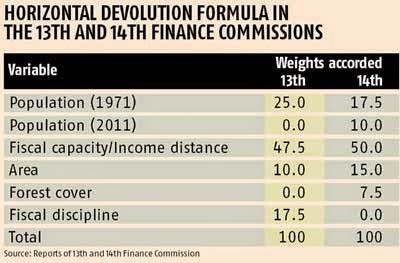 With 14th Finance Commission, the question is not of arithmetic (32 % VS 42 %) but signaling of a policy shift, we say great going.